Line your sidewalk with glowing luminaries. Use flameless candles and either regular ol’ lunch bags or fancy white bags, decorated in intricate Halloween shapes, letters, or whatever paper punch you have on hand (snowflakes, maybe, if Halloween is anything like today). After decorating the bags, weigh them down with kitty litter or sand so they don’t blow away. If you don’t want to cut shapes in the bag, you can still get a Halloween effect by adding felt or black paper silhouettes to the outside of the bag. Cover all your furniture with white sheets, so it looks like a real haunted house. Create a creepy terrarium with empty glass jars, twigs, cotton, and plastic spiders. Spraypaint pumpkins black and transform them into cats, or keep it classy with a coat of white, silver, or gold paint. Cut out little ghosts or bats or witch hats—or candles made with cardboard paper towel holders and LED lights, a lá Hogwarts Great Hall floating candles in Harry Potter—and attach with strings to the porch ceiling. 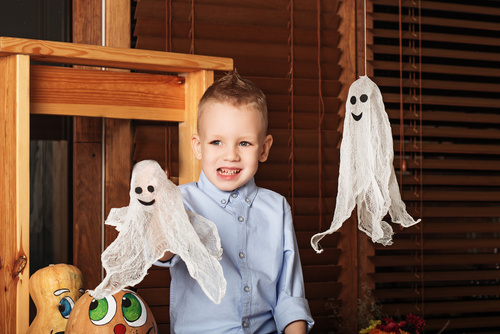 Create a cute and realistic “floating” cheesecloth ghost, as seen on Craftster Quickies. Fill the bottom of hurricane vases with candy corn. Wrap a black feather boa around a wreath and add Halloween decor, or leave as-is, and hang it on the front door. Replace regular light bulbs with ghoulish colors like purple, orange, or green. Create a fog-like experience with dry ice. You can buy dry ice at your local grocery store, but don’t buy it until right before you need it, keep it in an insulated cooler, don’t pack it too tight, and handle it with gloves—a dry ice burn is a real thing. Even if you don’t feel like decorating this year, you can still get into a festive mood with scary movies, a trip to a haunted house, or spooky apps and desserts, available through the Lunds and Byerlys catering menu.